For the more creatively inclined, sometimes it’s not enough just to buy a pre-designed set of duvets and curtains for your house. Buying a set of plain white linens from somewhere like Linens Direct might seem like a dull choice on the surface, when in reality it gives you a great opportunity to flex those creative muscles and create an innovative design of your own. There are plenty of ways to alter a set of white sheets or a pair of curtains; it just depends on where your skills lie or what it is you have in mind. For example, sewing is a very popular choice and has seen the creation of many beautiful and colourful patterns and design, though not everyone is adept at needlework and it often requires a lot of effort and concentration. However, sewing can be a great way to give a plain duvet a little pop rather than changing it completely; you could sew a colourful border pattern, for example, or a top and tail design to make the duvet or curtains stand out. Alternatively, you could use fabric pens and paints to draw on patterns instead. Not everyone is an artist, but if you have the flair for it then it’s definitely worth a crack. You don’t even have to draw the patterns yourself if you already have something in particular in mind; you can always take a design or pattern that you like, adjust it in photo shop and then use that as a stencil or something to trace from. Tracing will help to keep the design consistent and clean-looking whilst minimising the chances for errors. Bright colours and fun characters can make excellent duvets for children, or be used to decorate the curtains in their room. Block prints are also a good idea. 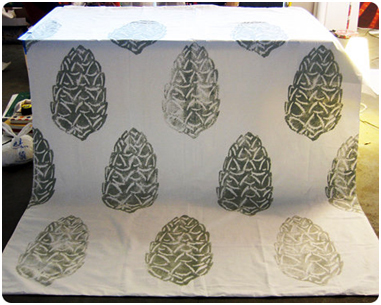 The process isn’t unlike the arts and crafts you used to do at school, when you’d take a carved potato, dip it in paint and print it on the paper to make a block pattern, but instead you’re applying it to fabric. You can even use cardboard in order to make the blocks, making it a relatively cheap way to create the print. Draw out the chosen pattern onto the cardboard, carefully cut it out and cover in paint with a foam roller for an even spread and then apply to the fabric. Ensure that the material is laid out smoothly and evenly and make sure you practice on something else a few times in order to get the hang of it; otherwise it’ll just be a waste of money. This method is a little more complicated than others and certainly takes more time and effort but one that produces a fantastic result when done right. DIY duvets and curtains may not be standard practice yet, but they’re certainly growing in popularity. The simplicity of a white duvet or pair of curtains offers a multitude of creative possibilities; from charming prints of your child’s favourite characters to a simple pattern of flowers or leaves, you can do whatever you like and you’ll be left with something unique and entirely your own.